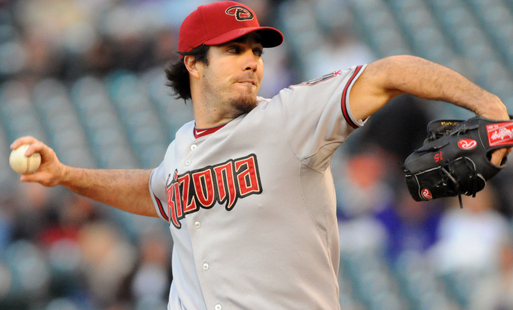 Dan Haren was selected in the second round of the 2001 amateur draft by the St. Louis Cardinals. He pitched partial seasons for the Cardinals in 2003 and 2004, starting 19 games and compiling an undistinguished 6-10 record with a 4.85 ERA, and appearing out the bullpen in five postseason games for the Cardinals on their way to a World Series loss in 2004. Nonetheless, his minor league performance and potential was considered strong enough that he was a key piece, along with Daric Barton and Kiko Calero, in a trade to the Oakland Athletics for Mark Mulder in December 2004. Haren quickly established himself as a quality major league starting pitcher with the A’s, throwing 623 innings over three seasons, 2005-2007, posting a 3.64 ERA while striking out 531 batters and walking only 153. After the 2007 season, Haren found himself on the other end of the Oakland pitching salary churn, traded to the Arizona Diamondbacks, along with relief prospect Connor Robertson, in exchange for a litany of young prospects: Brett Anderson, Carlos Gonzalez, Dana Eveland, Chris Carter, Aaron Cunningham and Greg Smith. 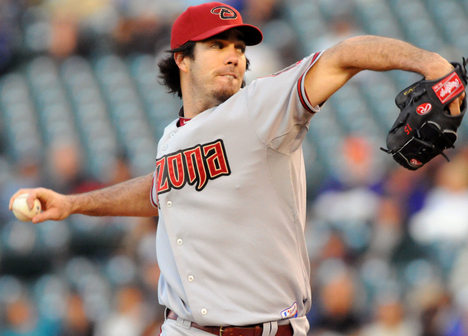 He put up a 3.56 ERA in 591 innings with Arizona, striking out 578 and walking 107, but two and a half seasons later, Haren is on the move to a new team in a deal again motivated by salary concerns. As of Sunday, he found himself back in the American League, pitching for the Los Angeles Angels of Anaheim. He’s put up strong numbers in both Oakland and Arizona. How has he done it? Let’s look at what kind of pitches Haren throws. Dan Haren throws five types of pitches: a four-seam fastball, a two-seam fastball, a cut fastball, a split-finger fastball and a curveball. In his days in Oakland, he threw a circle change-up, but indications are that he has abandoned that pitch more recently, and I don’t see any evidence, either in the PITCHf/x data or from game photos, that he still throws the circle change with any regularity. 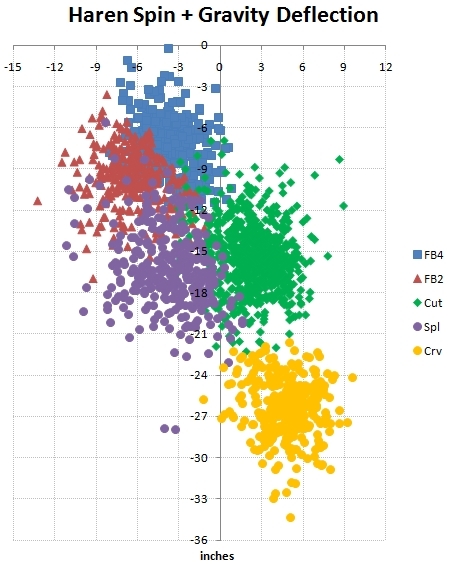 Let’s look at what the PITCHf/x data show us about the pitch speed and spin axis of the pitches he has thrown during the 2010 season. Another interesting way to look at his pitches is to see how they move. This chart shows the movement from the spin force and from gravity from 40 feet out to the front of home plate. The horizontal dimension is shown from the catcher’s perspective. If you really want to test your RORSCHACHf/x skills, you can look only at the spin-related pitch deflection. Haren’s pitches can be very hard to tell apart in that graph. 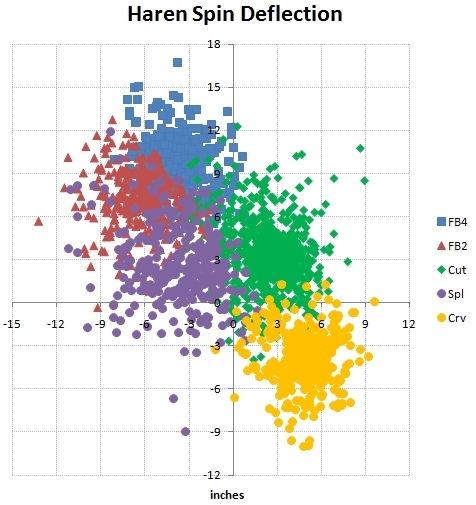 It’s fairly typical for a pitcher to have two or three pitch clusters with overlapping spin deflections, but Haren manages that feat with all five of his pitch types. (Tim Lincecum is another pitcher whose spin deflection chart looks much like Haren’s.) 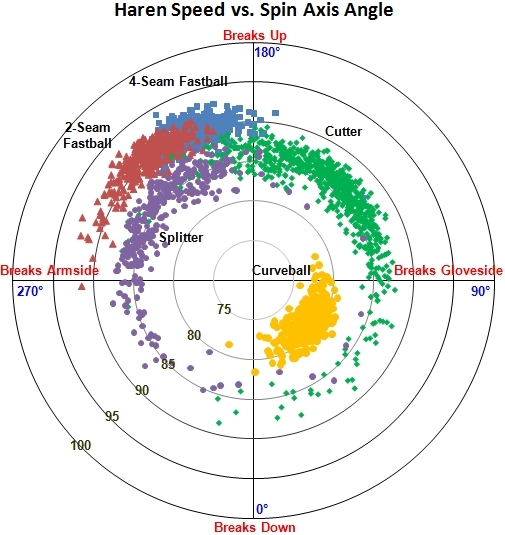 Introducing speed, or similarly, gravity, as a third dimension helps differentiate his pitch types, but ultimately, getting accurate pitch classifications for Haren required me to look at his data game by game. Even still, I’m not 100 percent confident in my separation between his four-seam and two-seam fastballs. I did the best I could from the data, and I probably got close, but not perfect. His four-seam fastball averages just over 90 mph. He gets four inches of tail and 10 inches of hop from the spin on this pitch, which is pretty typical for a fastball thrown from his high three-quarters arm slot. In 2010 he hasn’t relied on this pitch very much, using it only 12 percent of the time to right-handed batters and 18 percent of the time to left-handed batters. Haren throws his two-seam fastball just as hard as his four-seamer, averaging just above 90 mph. He gets six inches of tail and seven inches of hop due to spin deflection on the two-seamer, which results in, on average, about four inches of difference in the movement between his four-seamer and two-seamer. He has thrown the two-seamer about 25 percent of the time to right-handed batters and 29 percent of the time to left-handed batters. Haren’s bread and butter during the 2010 season has been his cut fastball. It averages 86 mph, or about four mph slower than his four-seam fastball. The average spin deflection on this pitch is two inches of cut and three inches of hop. The cutter is his mainstay against right-handed foes, to whom he throws it fully 40 percent of the time. Against lefties it serves as an equal partner with his other pitches; he chooses it 20 percent of the time to left-handed batters. The pitch for which Haren is best known is probably the split-finger fastball. He throws it 85 mph with an average spin deflection of four inches of tail and three inches of hop. When you include the effect of gravity on the slower pitch, his splitter drops nine inches more than his four-seam fastball over its last 40 feet of travel. He uses the pitch about equally to righthanders (14 percent of the time) and to lefthanders (12 percent of the time). The final weapon in his arsenal is a spike curveball. His curve averages 79 mph, with five inches of cut and four inches of drop due to spin. He favors this pitch to left-handed opponents, using it 20 percent of the time, and avoids offering it as often to right-handed batters, using it only nine percent of the time against righties. Next, let’s look at how he mixes his pitches in different ball-strike counts, which I’ve split out by batter handedness. Haren has frequently started right-handed batters with either a cutter (41 percent of the time) or a two-seam fastball (32 percent). He has used the cutter in any count, but particularly often at 2-0, 3-2 and 2-1. On the other hand, he has used the two-seamer early in the count, but not as often when the counts go deep, particularly with two strikes (only 14 percent of the time). His curveball has come out early in the count. 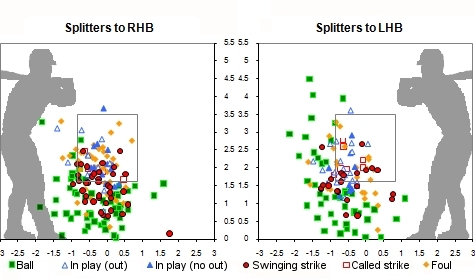 With two strikes, however, he has abandoned the curve (4 percent) and turned to other pitches, notably the splitter (29 percent) along with the cutter (44 percent), for the strikeout. Haren has started left-handed batters with a two-seam fastball (44 percent of the time) or a curveball (29 percent). He has continued to rely on these two pitches when he has fallen behind in the count: 38 percent two-seamers and 24 percent curveballs. However, once he gets at least one strike on the batter, he has shifted away from the curve (14 percent) and the two-seamer (19 percent) and brought out the cutter (27 percent) and the four-seam fastball (23 percent). With two strikes, he has brought the splitter into play (23 percent of the time). 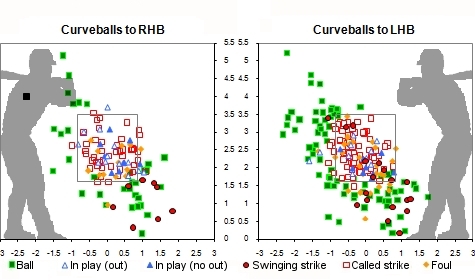 What kind of results has Haren gotten with each of his pitch types in 2010? The first thing to notice is that he throws all five pitches for strikes. He’s especially impressive in that regard with the curveball (68 percent strikes compared to league average of 57 percent) and the cutter (73 percent strikes vs. major league average 63 percent). The second thing to notice is that his cutter and splitter are great at generating whiffs. He gets swings and misses on 19 percent of the cutters he throws and 20 percent of the splitters. League average is 10 percent whiffs for the cutter and 17 percent whiffs for the splitter. His two-seam fastball is on the other end of the spectrum, generating a swing and a miss only two percent of the time, compared to six percent for the league. The third thing that sticks out is that all five of his pitch types show worse than average BABIP and vulnerability to the home run this year. Due to time constraints, I chose not to investigate further for this article, but it would clearly be interesting to know how his 2010 rates in these categories compare to previous years for the various pitch types. Let’s look now at where he locates his pitches to right-handed and left-handed batters. Strike-zone location charts are shown from the perspective of the catcher. The location of a pitch is indicated where it crossed the front plane of home plate. 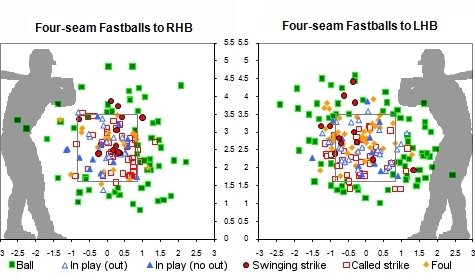 Compared to most pitchers, Haren has used his four-seam fastball sparingly in 2010. A typical pitcher throws a four-seamer a third of the time or more. According to my classifications, Haren has thrown the four-seamer only 15 percent of the time in 2010. I mentioned before that I’m not fully confident in my separation between the two-seamer and four-seamer, so it’s possible he’s thrown the four-seam fastball as much as 20 percent of the time. In any case, it’s not his main pitch. That title belongs to the cutter. His four-seam fastball seems fairly pedestrian. I don’t mean that as an insult. It’s a league-average fastball that he can throw for strikes and get decent results. He has tended to spot it outside against right-handed hitters and on both sides of the plate to left-handers. The whiffs he gets with this pitch are on pitches up and away. This is his go-to pitch with two strikes on a left-handed batter, and 21 of the 63 strikeouts he’s recorded against lefties have been on the four-seamer. 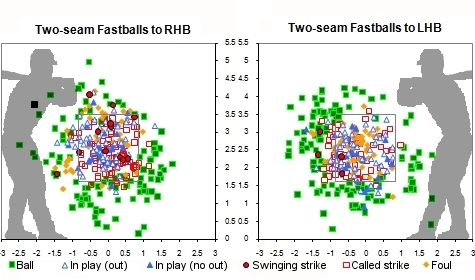 Haren has thrown his two-seam fastball mostly away to both right-handed and left-handed batters, though he has been more in the heart of the strike zone to right handers. He has thrown the two-seamer for 68 percent strikes to right-handed batters and only 60 percent strikes to left-handed batters. Batters have put this pitch in play 23 percent of the time and have batted .364 with eight home runs in 151 at-bats when they do so. 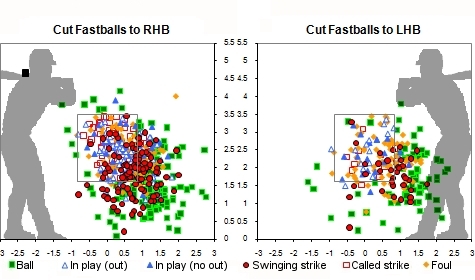 Haren has relied heavily on the cut fastball this year, particularly to right-handed batters. He puts the pitch low and away to righties and gets lots of swings and misses when he does so, even well out of the strike zone. When he misses a little bit and leaves the ball over the plate, right handers have had decent success at putting the cutter in play. To left-handed batters, he has kept the cutter low and inside, generating a lot of foul balls and swings and misses, even in off the plate. When he has left the cutter over the plate to a lefty, it’s been tattooed, to the tune of a .472 batting average and four home runs in 36 at-bats. Haren keeps his split-finger fastball down. Down and in to right-handed batters, down and away to left-handed batters. Both righties and lefties have chased his splitter down out of the strike zone unless he buried it in the dirt. He has used his curveball often to left-handed batters, and he has gotten a lot of called strikes to both righties and lefties. Batters will occasionally chase his curveball down out of the zone, but mostly they have laid off of it (32 percent swing rate versus 37 percent for the league). 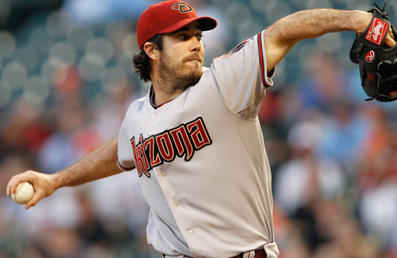 Dan Haren has a plus pitch in his cut fastball, and his splitter also seems to be a solid pitch. His fastballs and his curveball appear to be fairly average. Where Haren excels is in his ability to throw five different pitches for strikes. That surely keeps batters off balance and from sitting on any one pitch. The results have been good over his six-plus seasons, and it will be interesting to see how he performs in an Angels uniform. PITCHf/x data is courtesy of Sportvision and MLB Advanced Media. League average pitch information is courtesy of Harry Pavlidis. Pitch classifications are by the author. Good stuff, especially finding out about his 2-seam and 4-seam FB. Always seemed like he threw more 4-seam to me. Been following Haren since he broke in as a RP for Cardinals. Started as a FB, CB pitcher. CB being his out pitch. Then moves to Oakland, where he develops the split (that seemed to break down and in to left-handers) and scraps the curveball. Then goes to ARI and starts using a cutter which has been his most effective pitch, at times. Now throws the CB again. He has been caught by more than one catcher. It would be interesting to see how his (and other pitchers)pitch use and pitch values change based on the catcher. Maybe this could be a way to rank catcher effectiveness, although I think sample size may be an issue. I am not really smart enough or motivated enough to follow up on this, but if any of you awesome THT writers want to, that would be great. This is really great, Mike. I particularly love the game photos showing the pitch grips. When evaluating swings-and-misses, which metric do you prefer – whiffs/total pitches, or whiffs/swings? Great job Mike. Taking on Haren is no small feat … as you noted, classifying his pitches is a tedious and sometimes slippery task. I often wonder if the subtleties that confound the analyst correlate to those that stifle the hitters. Haren’s splitter location is fantastic. Isn’t that generally a pitch that’s hard to command? Mike do you think you could show some plate discipline stats on the splitter? O-Swing, Z-Swing, etc? I’d be interested to see how they compare to the league average for splitters. Nick, I don’t have that information, though I agree it would be interesting. Wow, that’s really a different pitching approach than what he had in Oakland. In Oakland his fastball was more 93-94, and he lived on the outside corner with it. And then he’d throw the split which looked exactly like his fastball except it’d drop away. He rarely threw a curve or cutter in those days. He’s always been vulnerable to the dinger, however. But has made up for it with his outstanding control.